Despite facing discrimination at every step, Kaushal Panwar managed to achieve her dreams. But she says her identity, for people around her, is still that of a Dalit. It’s like hitting a brick wall with bare fists. You could just give up, thinking you’ll make no more than a scratch. Or you could smash through one day, with the help of a chalk and a slate. When the little Dalit girl first turned up for Sanskrit lessons one morning, it made her high school teacher in Haryana furious. Kaushal Panwar, born in the Balmiki caste, among the lowest of low castes, was back the next day. The teacher had no option but to allow the seventh grader to attend, but she had to sit in the last row. She did not mind—just as long as she could learn, she reasoned to herself. Panwar, then in her early teens, would not have known what she was about to take on: Ancient Hindu texts forbid women and members of low castes from studying Sanskrit, the language of the Vedas and other holy scriptures. But for Panwar, studying the classical language and reading Sanskrit religious texts was opening up her world, offering new meanings in complex historical contexts. It was literally like reading a guide on how and why to discriminate against the so-called lower castes—the key, if you like, to unlocking the behaviour of her teacher. It upset and enraged her, but Panwar had found her calling in life: She secured her PhD in Sanskrit and launched into a life in academics. Panwar is an assistant professor in the Sanskrit department in Motilal Nehru College, Delhi University. She is fiery, confident and uncompromisingly forthright—just the kind to break down walls. She proudly says she is a Balmiki, unlike many others of her caste who change their surnames in order to escape discrimination. Society, Panwar says, doesn’t let you forget your caste and its long history of discrimination. A small pond—that’s what most of Panwar’s childhood memories revolve around. Growing up in her village in Rajound in Kaithal district of Haryana, the pond was where Panwar played, dried cow dung cakes, bathed cattle and washed clothes. As soon as the adults went in for their daily afternoon siesta, Panwar and her friends would scamper out to jump into the pond, locally called johari or jodh. The village was dominated by upper-caste Rajputs, and only a few houses belonged to Balmikis. One day, a group of Rajput girls saw the Balmiki children bathing in the pond. “Paani ko tumne bheet diya (You made the water impure),” they shouted, says Panwar. She was all of seven or eight, but she knew something was terribly wrong. Alone in that group of several children, both boys and girls, Panwar instinctively took a stand. “I said, ‘Since we have made this water impure for you, don’t use this pond ever again and leave it for us’.” The Rajput girls summoned boys from their community and a fight followed; village elders joined in, and it lasted for more than a month, Panwar says. “There are layers of discrimination that you witness…The more you observe, the worse things become, because then you become aware of even the subtle hints. How does a child know the difference between man and woman…who tells them? The society, right? The same society teaches us about caste. Like gender, caste is also taught,” she says. From being barred a drink of water from a tap in a temple near her house, to being forced to wear a pink uniform while upper-caste students wore blue, to being scolded in class because she could answer questions that upper-caste students couldn’t, Panwar’s life is full of stories of discrimination and her fight back . That Sanskrit class for instance. It was the seventh grade, and students had to choose one of three elective subjects: Home science, music or Sanskrit. Panwar chose Sanskrit. To her, Sanskrit was just another subject. To the Sanskrit teacher, it was anything but. Sanskrit teachers in village schools are almost always from the upper caste. To her teacher, this was blasphemy. For long, the learning of Sanskrit has been restricted to the upper castes. “Sanskrit had become a vehicle for the expression of India’s historical social inequalities, based on the Hindu caste system,” says Columbia University professor and Sanskrit scholar Sheldon Pollock, who started a fellowship in Sanskrit at his University for Dalits to study the language. Brahmin privilege ensured their special access to knowledge and to the language of knowledge—Sanskrit—and preserving this privilege meant denying lower castes access to these resources. It was a remarkable intervention. Panwar’s parents were daily wage manual labourers. Illiterate, they spent most of their lives paying off debt without even knowing whether their hard work was proportional to the amount they took as loan from landlords. Panwar still didn’t know that caste played a role in something as basic as the choice of language a child could learn. Slowly, she realized what the outrage of her teacher and classmates really was all about. 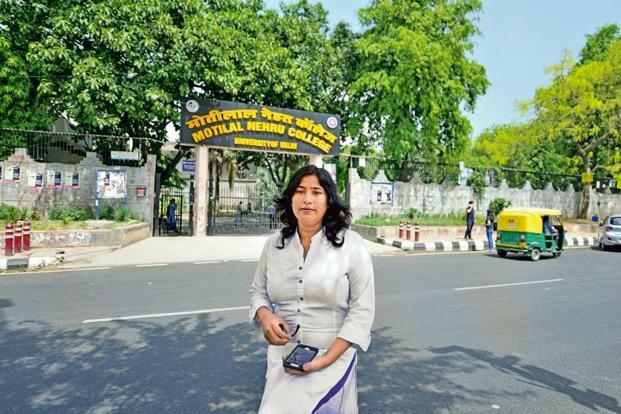 She completed her Bachelors in Sanskrit from the Indira Gandhi Mahila Mahavidyalaya in Kaithal district, Masters from Kurukshetra University, MPhil from Maharshi Dayanand University, Rohtak and, finally, PhD from Jawaharlal Nehru University (JNU), Delhi. The more she read, the angrier she became. But she wanted to keep reading. “Both, as being a woman and being a Dalit, reading these texts shakes you up. It is so derogatory, so outrageous, at so many levels,” she says. Panwar’s story is similar to that of Kusum Pawde—although the two are set apart from each other by thousands of kilometres. Pawde grew up in Maharashtra, a testament to the pervasive nature of caste. When Panwar decided to pursue higher education, her teachers kept telling her: “This isn’t like high school. Mastering Sanskrit is not something that you or your people can do.” Panwar kept proving them wrong. Studying on stipends, and simultaneously working as a labourer in the sites around her college, and as a manual scavenger during her M.A, Panwar made it through. There was this one time when, on seeing her emerging from the jhuggi (a slum dwelling), her classmates who stayed in the hostel stopped to talk to her—not out of sympathy but to make fun. Another time, when she was doing her M.A, she went with her aunt to manually remove human excrement from a house, which turned out to be her classmate’s. In 2012, Panwar gave a lecture on The Situation of Shudras in Vedas at Harvard University, US, and appeared in Aamir Khan’s television show Satyamev Jayate, that brought her recognition and fame. Unlike many others, she wants to tell her story because she is proud of where she is. But there is too much to forget and forgive. Memories of how she was not allowed to drink from, or even touch, the earthen water pitchers in her school still infuriate her. She remembers how, in anger, she broke several of these pitchers with her takhti(traditional wooden writing slate). “Caste discrimination has not ended in India. It has just changed its form,” she says referring to how modernization and industrialization has broken the traditional model of caste-based discrimination that existed earlier. Panwar has achieved what she wanted to, but she says her identity, for the people around her, is still what it was—that of a Dalit.